When you say the three letters NBA, certain things cross your mind. Some say those three letters remind them of a better time when Michael Jordan shot a fade away at the buzzer to win the game. Some say it reminds them of the time that the dream team was lead by the greats Pippen, Bird, Jordan, Barkley, and Johnson & won the gold in the 1992 Olympics. Here in Orlando, however, those three letters remind most of us of the restaurant at CityWalk at the Universal Studios Florida Resort. I had the pleasure of going to the restaurant, taking a tour, and having an amazing food review. Lets look into what makes NBA City more than just 3 letters! NBA City has 3 components that I need to mention: The NBA Store, The Arcade, and, of course, the restaurant. 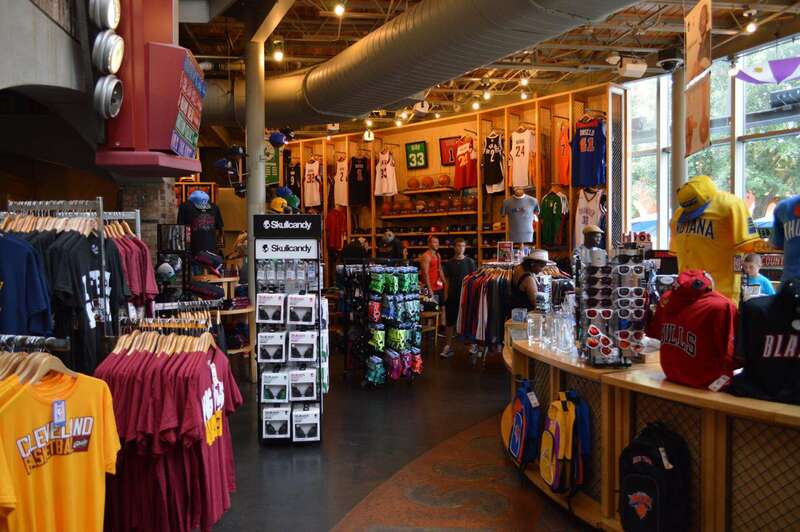 The NBA Store has all the NBA licensed merchandise that you could want! Being that this is Magic territory, a majority of the items come in the home town’s colors, however, the store carries a ton of other teams including the Heat! The arcade has a ton of basketball games and some other arcade games including some first person shooter and pinball games. Then there is the restaurant and bar. Lets focus on that topic for a while! The restaurant is set up with everything NBA related. Some of the booths are set up like lockers, there are TV’s everywhere playing NBA and other professional sports, and there are a ton of photos showcasing some of the best players from the old days of the NBA. 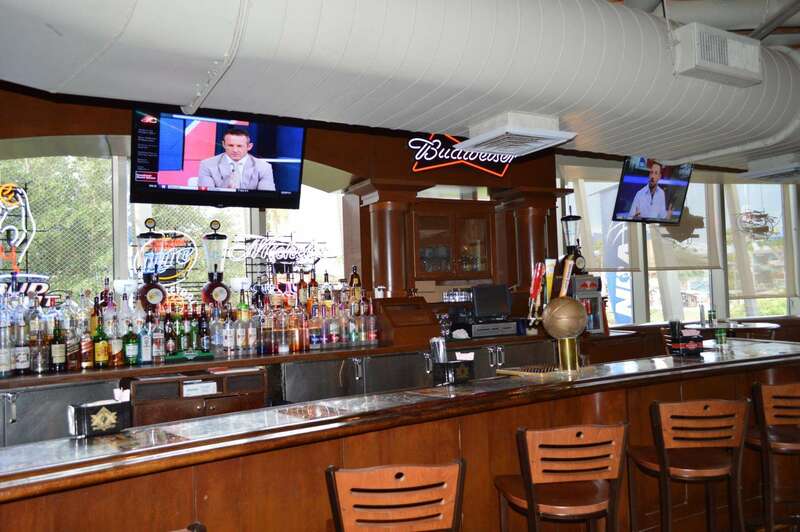 Enough of the appearance of the restaurant and lets get to the real starting lineup for the NBA Cafe at Universal, the food! 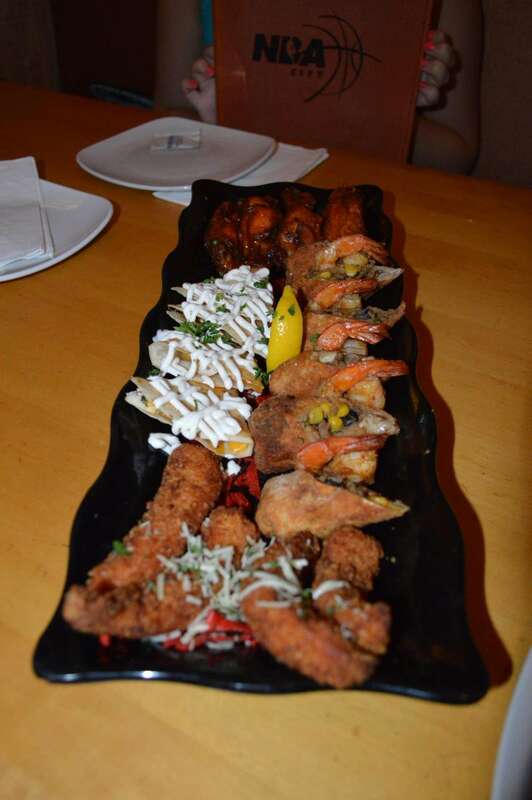 We started our review with the 5 on 5 platter which includes almost everything on the appetizer menu. The platter included Parmesan Chicken Tenders, Grilled Chicken Quesadillas, Wings your way, Steamed Shrimp, and Southwest Shrimp and Chorizo Eggrolls. Parmesan Chicken Tenders- Fresh chicken tenders seasoned and encrusted with a Parmesan and Japanese breadcrumb mixture. The tenders are served with an Asian honey mustard sauce. These tenders had a nice crunch on the outside and had moist chicken inside. The sauce went great with these tenders! Grilled Chicken Quesadillas- Large flour tortillas stuffed with smoked chicken, cheddar cheese, jalapenos, bell peppers, red onions, and fresh cilantro. They are served with pico de gallo, shredded lettuce and drizzled with sour cream. These quesadillas were full of flavor and had a nice kick to them. Wings Your Way- The wings are signature oak-smoked chicken wings, lightly fried and tossed with your choice of sauces. We had our wings with Buffalo wing sauce. The wings had a nice crunchy outside and a ton of flavor. The wood smoke flavor really came through on these wings for me and I highly recommend them! Steamed Shrimp- The shrimp were steamed with the shell on and had a great taste to them. Sometimes when you have shrimp they taste like they have been frozen, but these did not have that taste. They were served with a cocktail sauce and were a great addition to the platter. Southwest Shrimp and Chorizo Eggrolls- Eggrolls filled with a mixture of shrimp, Chorizo sausage, corn and black bean relish, herbs and spices. The rolls are then fried lightly until crispy. The eggrolls are served with a cream sauce and were my favorite appetizer of the night. I want the recipe for these eggrolls because they are the best I have had in a while! Everyone at the table loved the rolls as well! Jaca had the Blackened Mahi Mahi for dinner. The Mahi Mahi is a 8 ounce piece of fish coated with a blackened seasoning, grilled over an oak fame and served with wild rice and spinach. 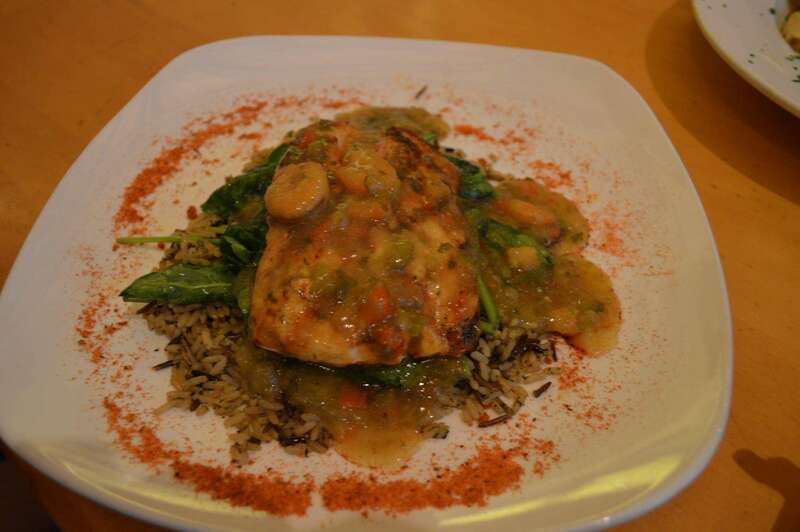 The fish is then topped with a shrimp curry sauce. Jaca said the fish was very flavorful and moist. The curry sauce enhanced the flavor of the fish and the shrimp was the icing on the cake! Vivian had the Chicken Penne pasta. 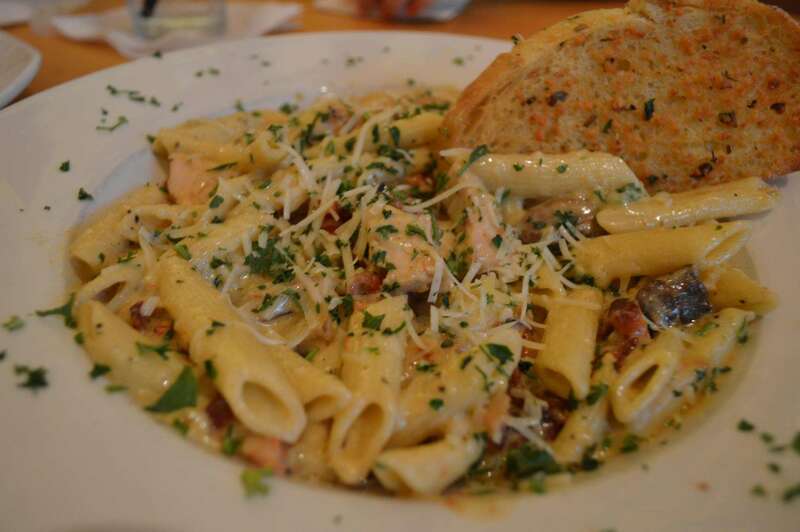 The pasta features oak-grilled chicken sauteed with fresh mushrooms, smoked bacon and sun-blushed tomatoes. This is then tossed with penne pasta in a pesto cream sauce. I had some of this dish and have to be truthful for a minute. When I am at a restaurant that has a wide variety of food I tend to stay away from pasta because it is normally bland and lacks flavor and complexity. With that being said, NBA City has completely ruined my opinion! The sauce was one of the best sauces that I have ever had. I know exactly what dish I will be eating when I return to NBA City! I had the Oak Smoked Baby Back Ribs. This dish had a full rack of tender, tasty baby back ribs rubbed with spices and slowly smoked over oak coals then basted with homemade barbecue sauce. 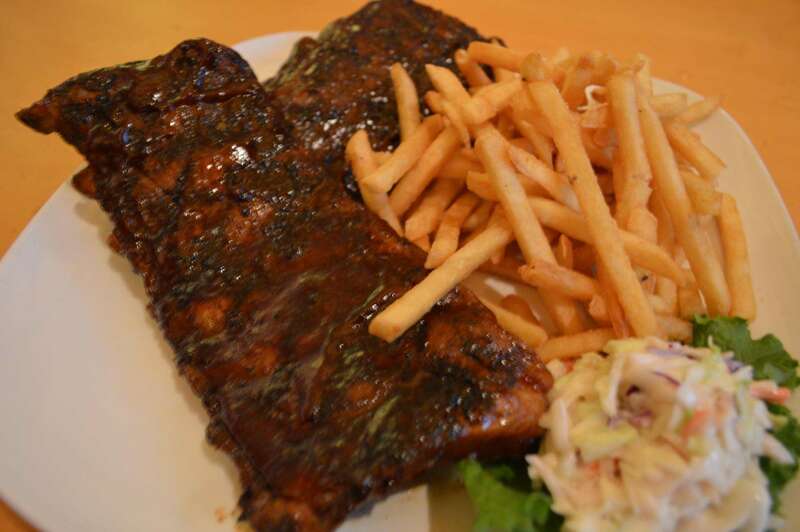 The ribs are served with a homemade coleslaw and crispy french fries. For our regular readers, you will know that I have a soft spot for BBQ. I am sometimes hesitant to get ribs from a place other than a BBQ restaurant but I went outside of my comfort zone. I had the ribs here and I am glad that I did! The ribs were tender and fall off the bone! The ribs had a great mix of flavor from the spices and smoke as well as the fresh flavor of the sauce! We asked what was the most popular dessert and there was one clear winner. Our host Jose told us that the Towering Cheesecake was on the menu and went away a while ago. After a strong push from social media, the Towering Cheesecake made it’s return to the cafe menu! The Towering Cheesecake is a traditional favorite with a twist. 4 towers of cheesecake are lightly fried and rolled in cinnamon sugar. 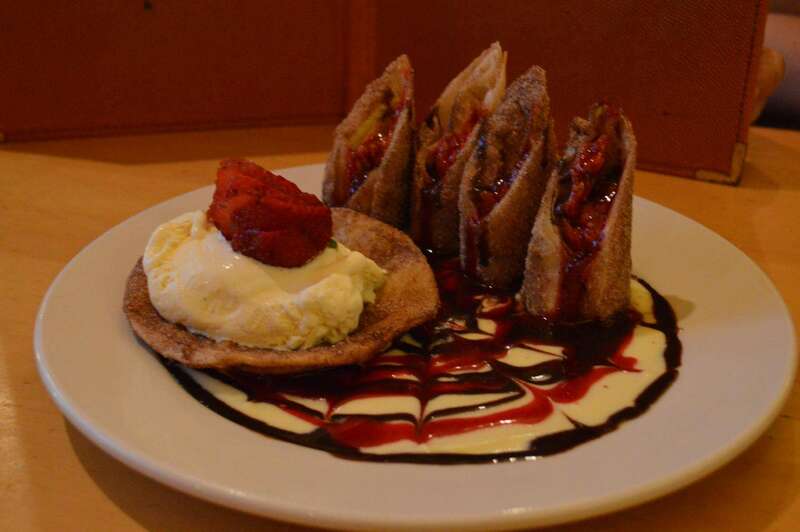 The cheesecake is accompanied by vanilla ice cream in a cinnamon tortilla basket on a plate of creme anglaise. This cheesecake was amazing and huge for our family of 3! The filling was amazing and the crunch of the outside was great and full of flavor. I have to admit that there is a idea for me about restaurants at theme parks. The idea is that they are all cookie cutter restaurants where you are paying for the name and that is it. There is also an ideal that the food is mediocre. I am happy to say that NBA City has wiped away that mindset for me and my family. The food was fresh and was full of amazing flavor. I will also say that even though NBA City is classified as a themed restaurant, they do not need the NBA name to make it in Orlando. Take away the basketballs, the pictures and the arcade and you still have a great restaurant that cares about quality food and customer satisfaction! Orlando Fun and Food would like to thank NBA City and Jose Reyes for inviting us out for a great time! NBA City is a great restaurant and the food speaks for itself. 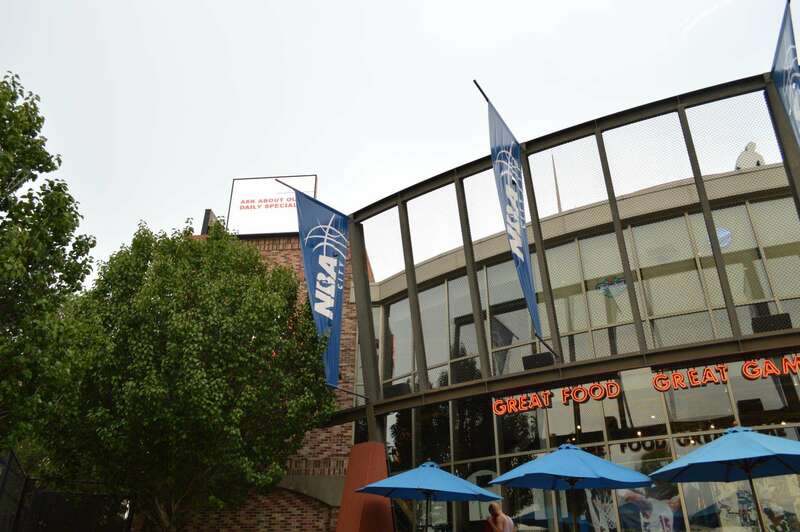 If you are looking for a great restaurant at Citywalk, make sure you check out the NBA City! 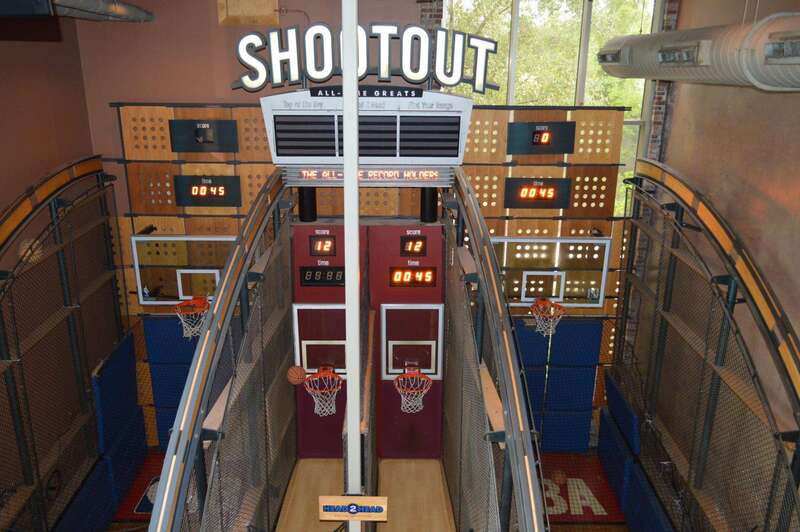 Have you ever been to NBA City? If so, what did you think? What was your favorite menu item? If not, will you be trying it next time you are in Orlando? Comment below and let us know what you thought! Next Post WWE and TNA Join Forces to Help Hope For A Single Mom!